Deutsch: Imaginäres Portrait von Aristophanes (das war in der Tat eine Glatze). 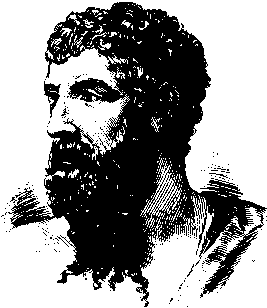 English: Imaginary portrait of Aristophanes (who was in fact bald). Español: Retrato imaginario de Aristófanes (que en realidad era calvo). Français : Portrait imaginaire d'Aristophane (qui était en fait chauve). Italiano: Ritratto immaginario di Aristofane (che era in realtà calvo). Português: Retrato imaginário de Aristófanes (que na verdade era careca). English: This book illustration was apparently copied from this one (comparison is easier with this small but flipped crop), which is reputedly made after a Roman bust (an imaginary portrait too). The picture itself is a low-res scan of what was most certainly an engraving (for reproduction in a 1896 printed book). The digital source doesn't provide credits for the illos.